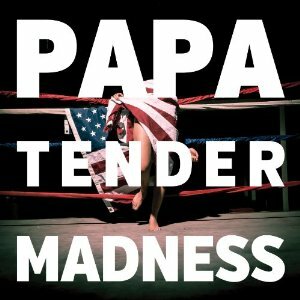 LA’s own PAPA are that rare gem of a band, that upon first listen whether live or on record demands the listeners attention and one can’t deny them it. They play a style of soulful R&B inspired indie rock, that also flirts with folky Americana elements. Their catchy harmonizing anthems can appeal to fans of any style of music. This impressive duo are made up of bassist Daniel Presant and singer/drummer Darren Weiss, who was also the drummer for San Francisco’s Girls. Since the release of their 2011 spectacular EP, A Good Woman Is Hard To Find, PAPA have been on a relentless tour schedule – opening for a who’s who of present indie rock bands like Ra Ra Riot, Grouplove, and Cold War Kids. For five years they have been honing their skill set, pouring everything they could into their debut full length, Tender Madness. The twelve tracks on the record are a roller coaster of a ride into the playful, romantic cleverness of Darren Weiss. After a brief instrumental intro, the album starts off with “Put Me To Work,” which was one of the albums two singles released. This track is a bit of a standout due to its blistering speed compared to the mid-tempo range the band usually threads. Even so, it showcases PAPA’s unbelievable talent to create addictive melodies in each one of their songs, no matter the pace. “Forgotten Days” starts with a steady bass drum beat, which is then accompanied by a funky bass before being filled out by piano and noodling guitar. Such a crafty song will have the listener unconsciously singing “I’m not blind, I don’t want to see. When I close my eyes, I’m where I want to be.” The album closes with The Replacements cover “Curls In The Grass”featuring one half of the country duo The Secret Sisters Lydia Rogers. A folky piano and twangy acoustic guitar driven song, lead by Darren and Lydia’s vocal harmonies, makes for an appropriate ending to a fantastic debut of a record.